« Who lives in a house like this? 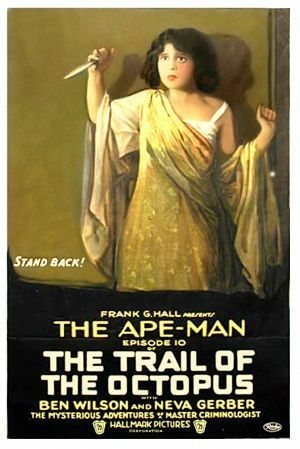 Episode 10 of our serial photoplay, THE TRAIL OF THE OCTOPUS, is entitled The Ape-Man, and unlike episode 9 it is NOT missing. But you may wish it was. 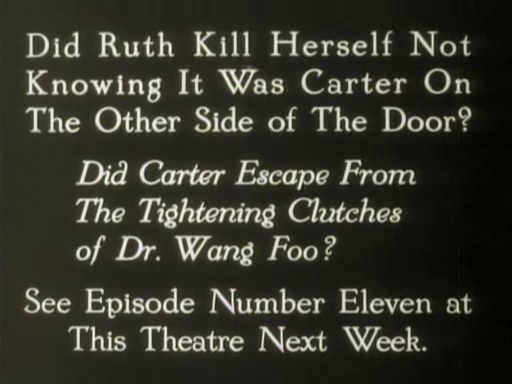 Wang gets his cat o’nine tails out, causing Carter to give himself away — but he’s trapped in the closet, not an ideal tactical position. It’s fair to say the situation becomes fraught. The bloodthirsty Wang Foo-ites riddle the closet with bullets. For about ten minutes. Get out of that! Meanwhile, as they say in the comics, Ruth’s dad, long feared dead, is in the American hotel when a fist fight breaks out between two rival factions — the rug merchant’s Satanists, and Raoul Bernay, who was also feared dead, and who has recently been caught impersonating Monsieur X. All clear so far? There will be a quiz later. Dead dad spots dead Raoul and realizes neither of them is really dead. The fight is protracted, fairly violent, and largely hilarious, and nearly tears down the flimsy hotel set, which would leave everybody in a right pickle. You can’t enact a serial photoplay adventure on an empty sound stage amid a heap of matchwood. Adventure requires exciting backdrops. That’s basic, man. Now Jan the Tunisian, the one who is obviously Monsieur X, turns up and plays a scene with Zora the vamp, just to let you know he’s still around. He also sports a nifty leather coat. He entrusts her with his stash of ceremonial daggers and asks her to meet him in Paris. So that’s exciting — we’re going to Paris. By complete coincidence, the not-dead-Raoul, rattled by his scuffle with the Satanists, is also considering a trip to Europe. Wang Foo orders Zora to go to Paris to rejoin and spy on the Satanists, which fits in nicely with her plans as she was heading that way anyhow. He tells her to meet him at No. 18, Rue Mort. I guess that would be in the 666th Arrondissement. Ruth finally opens the bullet-ridden closet to find Carter GONE. A furious Wang threatens to throw her to his ape-man, Borno. And I suddenly realize that Borno is the little servant guy in the Tarzan costume. Not really an ape-man, then. More like a primeval jockey. Nevertheless, Ruth is again faced with a fate worse than death, though mercifully not worse than being chased around the room by a scruffy jockey. She pelts him with throw cushions, but still he advances, implacable yet minute. Carter to the rescue — after running all around the building, he re-enters the room via the trap-door he’d used to escape (and which Wang Foo, the homeowner, apparently knew nothing about). Disabling the rampant dwarf by throttling them and then hurling him across the room, he tries to reach Ruth, who has barricaded herself in the next room. But, seeing the door bulge inward as he batters it, Ruth fears the ape-man is still coming for her, and prepares to plunge a dagger into her breast, probably hoping that will put him off the idea. This entry was posted on June 19, 2013 at 9:10 am and is filed under FILM with tags Trail of the Octopus, Yojimbo. You can follow any responses to this entry through the RSS 2.0 feed. You can leave a response, or trackback from your own site. 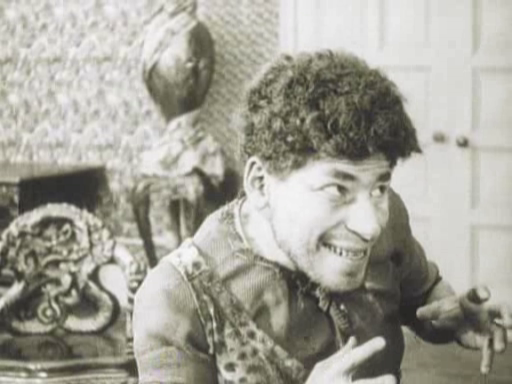 Borno: I first saw John George in Browning’s THE UNKNOWN (26), playing Lon Chaney’s lil’ buddy. According to imdb he was a working actor into the 1960s. He’s usually spotted playing newsboys, so it’s hard to imagine him as a full-on sexual threat. Which makes TRAIL OF THE OCTOPUS all the more bizarre . . . Yes. 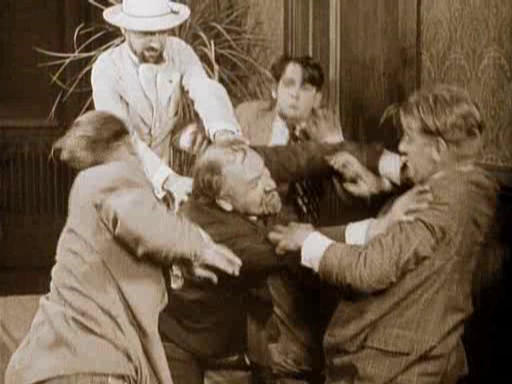 And he’s still being presented as a menace even after Carter throws him to the floor with a casual shove. What is it with diminutive newsies? Angelo Rossitto worked as a news vendor for real between movies, and plays the role in Dementia and in Confessions of an Opium Eater.